Ever wonder why you don’t see many well worn Kennedy Half Dollars? Since these coins were released right after John F. Kennedy was assassinated, many of them were taken out of circulation, and stashed by consumers. 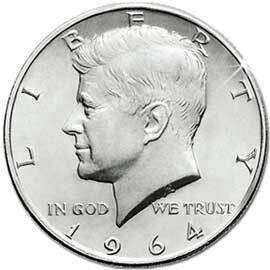 1964 was the first year of the Kennedy coins, and the last year for 90% silver coins. The 1964 Kennedy’s were made of 90% silver. No other circulated coins had silver content after 1964 except the Kennedy Half dollars. The 1965 to 1967 Kennedy’s are 40% silver. From 1971 to present circulated Kennedy coins are simply clad coins (no silver) that have little value except the 50¢ fiat value (fiat means by order of) the government says they are worth. The 1064 Kennedy’s weigh about 12.4 grams. 90% of that weight is silver, so they have 11.16 grams of pure silver. With silver at 28.00 per troy ounce they have a retail value of about $10.00 each. If you need to sell Kennedy coins, other silver coins, gold jewelry, silver, platinum, or any precious metals, just call Greg today at 928-710-2137. I’ll meet with you on your schedule.